I'm getting close to the end of this project. It has taken me far longer to complete than anticipated. I really haven't been knitting as much as I planned I would over the summer. So much more to do and so much more travel kept me from picking up my knitting. 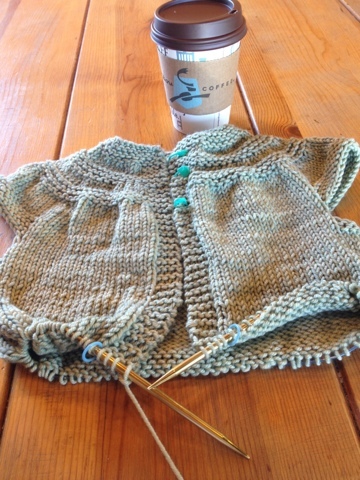 Now that I'm back to getting together with my Friday morning knitting group I'm made up my mind to get this cardigan done the end of September. I can do it. I'm under the pressure of my due date too, I'd like to get my baby blanket finished before the baby comes in early December. Meanwhile I'll keep going on this sweater making it my project focus. How about you? Whacha working on these days?